Apple made waves during Tuesday’s media event when the company announced that its iLife and iWork suite would be free for customers who buy a new Mac or iOS device. But the apps are also free for users who already have the apps installed, and one app is free, period. Here’s our guide to demystifying Apple’s new pricing structure on its iLife and iWork apps. When Apple first announced that its iOS apps would be free with the purchase of a new iPhone, I theorized that Apple might include a notification alert after you first activated your new device, with a link to download your free apps. Instead, there’s no link or alert to be found. If you want your free iWork and iLife apps—on OS X Mavericks or on iOS—you have to first visit the Mac App Store to do so. When you do, however, the “Buy” button for those apps will be replaced with “Download” or “Update” (or the iCloud icon on the iOS App Store). I’ll note that iWork and iLife apps only come free for the kind of device you’ve purchased—you won’t get the OS X versions of iLife and iWork for free because you recently purchased a new iPhone or iPad. Though I can’t yet confirm it (I asked Apple for more details but have yet to receive a response), I suspect that Apple associates the iWork and iLife suite with your Apple ID when you first activate a new device. That way, when you visit the app’s page, it shows up as already “purchased” on your account, and you can download away. Apple’s new iLife suite consists of three apps—iMovie, iPhoto, and GarageBand—available for both OS X and iOS. On the Mac side, you’re looking at iPhoto 9.5, iMovie 10.0, and GarageBand 10.0. iPhoto and iMovie each appear on the store for $15, while GarageBand is a free download with a $5 in-app purchase. All three apps require OS X Mavericks or later; if you attempt to download them while running an earlier version of OS X, you won’t be able to proceed. Apple’s iOS versions of these apps are all version 2.0 and require iOS 7 or later; iMovie and iPhoto show up as $5 on the App Store by default, with GarageBand again available as a free download—you can add more touch-based instruments for a single $5 in-app purchase. Like iLife, the iWork suite also consists of three apps—Pages, Numbers, and Keynote—which are available for both OS X and iOS. The new Mac versions are Pages 5.0, Numbers 3.0, and Keynote 6.0, and they too require OS X Mavericks; the iOS versions are all 2.0 and require iOS 7 or later. 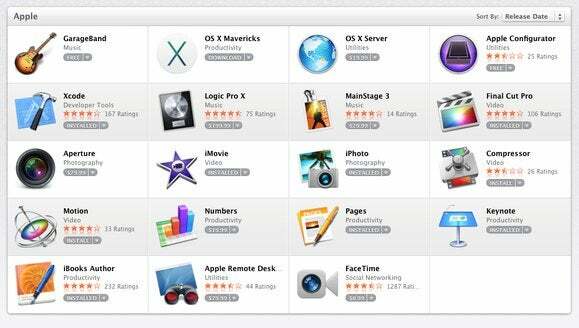 On the Mac, the three apps retail for $20 each; on the iPhone or iPad, they’re $10 each. So who gets these for free and who has to pay up? Read on. If you own iLife '11 or iWork ’09 apps (or v1 iOS apps) and you got them from the Mac App Store or iOS App Store: You should be able to download the latest versions for free by going to the app page on the Mac or iOS App Store. If you own iLife '11 or iWork ’09 apps for the Mac but did not purchase them from the Mac App Store: You should be able to download the latest versions for free by going to the Mac App Store and tapping Update, though you may need to first visit the Purchases screen, where you might see a box called “You Have [number] Apps to Accept.” This ties apps you have on your computer to both your Apple ID and a hardware identifier on your computer, and it should allow you to download free updates to these programs from any computer associated with your Apple ID. Some users (including yours truly) are reporting issues where the Mac App Store doesn’t recognize their copies; when they click on an iLife or iWork app’s price, they receive the following alert: “[App] is already installed and was not purchased from the Mac App Store. Do you want to buy [app]?” Macworld spoke with an Apple spokesperson who noted that there’s currently an issue with some legacy customers, and the company is working on a fix. That fix appears to have been implemented; on Thursday, several users told Macworld that they were getting the Accept Apps prompt. If you don’t own iLife '11 or iWork ’09 apps (or v1 iOS apps), or own older Mac versions: On the iLife side, you’ll have to buy iMovie and iPhoto at full price ($15 or $5, depending on platform). GarageBand is free for everyone to download, though the app does offer in-app purchases. Apple’s iWork apps are each $20 for the Mac, $10 on the iPhone or iPad. If you are buying a new Mac or iOS device: After you set up your device, you should be able to download the latest versions for free by going to their entry in the Mac or iOS App Store. According to Apple’s website, anyone who purchased a new Mac after October 1 or iOS device after the September media event is eligible. Updated at 8:48 p.m. with a statement from Apple about upgrading non-Mac App Store versions of iLife and iWork. Updated at 3:28 p.m. Thursday to note that problem has been resolved.